A nudibranch is a group of soft-bodied, marine gastropod mollusks which shed their shell after their larval stage. This group includes some of the most colorful creatures on earth. They are noted for their often extraordinary colors and striking forms. There are currently about 2,300 valid species of nudibranchs. 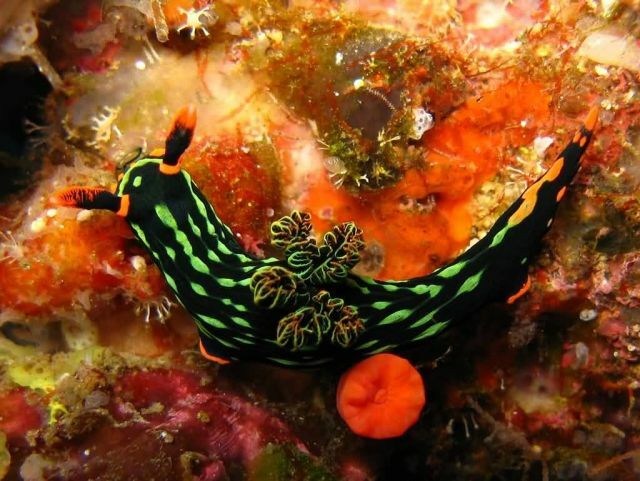 Nudibranchs occur in seas worldwide, including both the tropics and Antarctica. They are live in salt water to the depths of well over 700 m. Nudibranchs have cephalic tentacles, which are sensitive to touch, taste and smell.